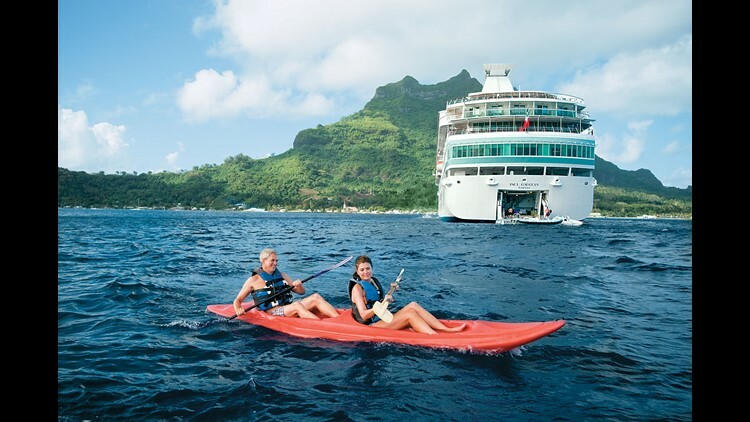 The tropical paradises of Hawaii and Tahiti are year-round cruise destinations for Norwegian and Paul Gauguin Cruises, respectively. Pictured is Paul Gauguin in Tahiti. The five-star Paul Gauguin was designed specifically to sail South Pacific waters. The ship measures 19,200 gross tons and carries 332 guests, providing one of the industry's highest space ratios of 58. Paul Gauguin was built in 1997 by the famed Chantiers de l'Atlantique shipyard (now called STX-France) at St. Nazaire, France for Radisson Seven Seas Cruises (later Regent Cruises). Shown in her original guise, the Paul Gauguin was sold in 2009 to newly-formed, Seattle-based Paul Gauguin Cruises, a subsidiary of Pacific Beachcomber SC, which owns several resorts in French Polynesia. In 2012, the Paul Gauguin was given a major refit that saw the addition of suites on aft Deck 7 and balconies to cabins on forward Deck 6 as well as a complete overhaul of the ship's soft fittings and décor. Paul Gauguin measures 513-by-71 feet and has an especially shallow draft of 16.9 feet that allows it to anchor in shallow inlets at places like Moorea and Taha'a. Paul Gauguin's popular Croatian captain Ante-Toni Mirkovic is in charge of a dedicated and friendly international staff and crew of 217, which gives the ship a 1.5 guest-to-crew ratio. On its seven night itineraries, Paul Gauguin spends two days each in Bora Bora and Moorea (shown). The spotless Paul Gauguin is a handsomely proportioned, intimate ship with seven passenger decks. An open sunning area tops the ship on Deck 9. Located at the base of the radio mast on Deck 9, the al fresco Bar de Soleil can be opened upon request for special cocktail parties and accommodates up to 200 guests. From Deck 9, there is a nice view of Paul Gauguin's midships pool and teak-covered lido. Open daily from 9:30 to 6:30, the Pool Bar is forward of the pool on the port side of the ship and accommodates up to 25 guests with included-in-the-fare drinks, soft drinks, wines, beer and genuine espresso drinks. On the forward/starboard side of the Deck 8 pool area, there is a sheltered terrace with cushioned seating. The ship's traditional, heated saltwater pool is framed in mahogany. On Deck 5, there are two sheltered, teak-lined promenades. A shuffleboard court is located on the starboard side. Accessed from aft Deck 4, Paul Gauguin boasts a marina with zodiacs, parasails, kayaks and snorkeling gear. Scuba gear can be rented for an additional fee. Located on aft Deck 8, the handsome 40-seat La Palette is a quiet daytime lounge and bar and a happening disco at night. It features rich wood tones and screens that open onto a large al fresco terrace. The outside terrace adjoining La Palette seats an additional 45 guests. Continental breakfast is served in La Palette from 6:30 to 11:00 AM on a daily basis. Afternoon tea is also available here. La Palette is also the go-to place for delicious fresh-pressed juices. On Deck 7, there is a 24-seat Captain's Reception room. A line of public spaces begins aft of the main foyer on Deck 6 with the gym, featuring a variety of cardio machines, weight machines. The Deep Nature Spa by Algotherm is directly aft of the gym and has five treatment rooms as well as a sauna and steam room. One hairdresser and two manicurists run the adjacent Deep Nature Spa Salon. This is one of the treatment rooms in the Deep Nature Spa. Everything from sundries to Tahitian black pearls and clothing are sold in Paul Gauguin's duty-free shop on Deck 6. Reference books, travel guides and other works with a South Pacific slant can be found in the library situated in the passage linking the public spaces on Deck 6. At the aft end of Deck 6, there is the Fare Tahiti, a vestibule with paintings and artifacts with a Tahitian theme. Three works by Paul Gauguin, including a menu he drew in exchange for a meal at a local cafe in Papeete, are among the items on display throughout the ship. The largest public space, the 314-seat Grand Salon can accommodate the ship's entire compliment of guests. The setting for lectures, movies and mainstage entertainment, the Grand Salon begins a line up of public rooms that spans Deck 5. Les Gauguins and Les Gauguines perform traditional Polynesian dances in the Grand Salon. Le Casino follows the Grand Salon on Deck 5 and features a gallery with 13 slots. Le Casino is also home to blackjack and roulette tables. Located next to Le Casino, the handsome Piano Bar accommodates 43 guests. The Deck 5 passage continues with a photo gallery. Here is the Photo Gallery during the once-weekly Polynesian Night. The Internet Center is accessed via the Photo Gallery and features eight computer stations. The Paul Gauguin also has Wi-Fi hotspots throughout the accommodation and public spaces. The 24-hour Reception Desk is located on Deck 4 along with a Travel Concierge Desk for booking shore excursions and SCUBA training. The pool adjacent to Le Grill can accommodate up to 100 guests for casual, buffet-style breakfast and lunch. Le Grill extends aft along either side of Deck 8 from the pool area. Cereals and freshly baked goods are available for breakfast in Le Grill. Additionally, there are fresh juices, cold cuts, yogurts, an egg and omelet station and much more. This is a section of the lunch spread offered up on a typical afternoon in Le Grill. At night, Le Grill becomes a reservations-required (but no extra charge) specialty dining venue that accommodates up to 60 guests. The 134-seat La Veranda is located on aft Deck 6 and open for breakfast and lunch with both buffet and menu offerings. Terraces on either side and aft of La Veranda can accommodate an extra 40 guests. For dinner, La Veranda becomes a reservations-only, complimentary specialty dining venue with capacity limited to 75 guests in scheduled increments. Settings include custom Bauscher chargers, Riedel stemware and starched linens. This is a fresh fish-skewer lunch entrée in La Veranda. La Veranda features an excellent salad bar with an array of fresh vegetables, daily dressings and a selection of olive oils and herb-infused vinegars. La Veranda also offers a special pasta station during lunchtime with a variety of homemade sauces. L'Etoile is the lofty main dining room on aft Deck 5, offering open-seating dinner from 7:00 p.m. to 9:30 p.m.
Table settings in L'Etoile feature custom-made Schønwald chargers that replicate the floral pattern in the seatbacks. This is a parmesan-tart appetizer infused with balsamic vinegar and extra-virgin olive oil in L'Etoile. And this is one of L'Etoile's decadent chocolate desserts. Handmade petits-fours cap off dinners in L'Etoile. One of the most extravagant dining options at sea are the new Marina Dinners, served on the marina platform during overnights at Bora Bora and Moorea. The largest cabins on the Paul Gauguin are two Owner's Suites on forward Deck 7. This is the 534-square-foot suite 7001 on the starboard side. It has a separate sitting area and bedroom, a walk-in closet, and an entry foyer. Suite 7001 has a bedroom with a queen-sized bed. The bathroom in Suite 7001 has a separate rainforest shower and full tub as well as a dressing area. Owner's Suites have their own private espresso makers and a selection of top-shelf teas. This is the balcony of Owner's Suite 7001. Owner's Suite 7002 is on the port side of the ship and measures 531-square-feet. Five Category A Veranda Suites measure 358-square-feet and are located on Deck 7. Owner's Suites, Grand Suites and Veranda Suites have butler service in addition to a regular cabin attendant. Seventeen Category B Veranda Staterooms measure 305-square-feet and feature sophisticated, soothing color schemes and warm wood tones. Sixty Three Category C Balcony Staterooms measure 239-square-feet. This is a Category C with a twin bed set-up. And this is a Category D with a queen-sized bed set-up. Modular bathrooms in all categories feature marble flooring, tubs, large sinks and generous storage space. Category C and D entryways feature dramatically lit stone tiki figures mounted in mirrored vitrines. This is the balcony of a standard Category C or D Balcony Stateroom. In-cabin breakfast service on the Paul Gauguin is one of the best at sea and can include an entire menu's worth of options, from fresh omelets to muesli, smoked salmon and freshly squeezed juice. Stateroom 415 is a 225-square-foot Window Stateroom with a modified floor plan for wheelchair access. This is the handicap-access bathroom in Window Stateroom 415. Fourteen Category F Window Staterooms feature twin portholes in lieu of the picture window. Paul Gauguin Cruises supplies deluxe L'Occitane toiletries (moisturizer, soap, shampoo, conditioner, bath gel) as well as shower caps and cotton swabs. Special bon voyage packages include a tropical floral arrangement, champagne, Godiva chocolates and fresh fruits. During its weekly roundtrip cruises from Papeete, Paul Gauguin calls at Motu Mahana, a private island off the coast of Taha'a. Motu Mahana has sunning and shaded areas, a volleyball court, local handicrafts, snorkeling, a fully stocked, included-in-the-fare bar and a lavish barbeque. This is a guest room at the Intercontinental Le Moana in Bora Bora. The beach at the Intercontinental Le Moana is one of the highest rated in the world. The Intercontinental Thalasso Resort and Spa is a five-star resort at Bora Bora that is also available for Paul Gauguin guests to utilize on a day pass or overnight stay. The Thalasso has a popular wedding chapel with a spectacular view of the reef through a Plexiglas floor. This is the living room in a typical suite at the Thalasso. The Intercontinental Moorea Resort is another Beachcomber-owned property that is available for Paul Gauguin guests on a day pass or overnight stay basis. This is the pool area at the Intercontinental Moorea Resort. No. 25: American Queen. American Queen Steamboat Company’s 3,707-gt, 436-passenger American Queen is not only the largest, most lavish riverboat of all time, it is a remarkably convincing avatar of those gingerbread-filigreed, high-fallutin’ steamboats of the Mark Twain era. No. 25: American Queen. Built in 1995, the American Queen is powered by a genuine steam engine that propels its massive wooden paddlewheel along the Mississippi, Ohio and Cumberland rivers that it calls home. No. 25: American Queen. American Queen’s interiors are fitted with lavish wood paneling, brass fixtures, ornate chandeliers, hammered tin ceilings and museum-quality Americana. No. 25: American Queen. Unlike the steamboats of yore, the five-deck American Queen boasts modern cruise ship comforts like air conditioning, some private balconies, a wading pool and gym, epicurean dining and lavish entertainment in a double-deck show lounge. No. 24: SS Legacy. Seattle-based UnCruise’s 1,472-gt, 88-passenger SS Legacy is also an avatar from of a bygone era -- in its case, the steamers that used to ply the coastal waterways of the U.S. Built in 1988 as the Pilgrim Belle, the ship looks better than ever in UnCruise’s smart gold and black livery. No. 24: SS Legacy. Despite the “SS” in its name, the SS Legacy is actually a diesel-powered cruise ship ideally suited for the Columbia and Snake rivers of the Pacific Northwest. With its vertical prow, layer cake superstructure, stovepipe funnel and sheltered promenades, the quaint ship blends in nicely with the scenic places it visits. No. 24: SS Legacy.While not as finely finished as the American Queen, the SS Legacy boasts interiors with hammered tin ceilings, dark wood veneers, chandeliers and floral soft fittings that pay homage to Victorian-era coastal liners. No. 23: MV Adriana. Before the cruise ship boom inspired by “The Love Boat” television series in the late 1970s, there was a fleet of pocket-sized, yacht-like vessels cruising the Mediterranean. One of the last survivors of this era is Adriana Cruises' MV Adriana. This little lady has a sleek, well-balanced profile with a sharply raked bow, sheer (a lengthwise curvature that dips slightly amidships), a sculpted, finned funnel and a rounded cruiser spoon stern. No. 23: Adriana. Perhaps the most obscure of all the cruise ships on this list, the 4,490-gt, 350-guest Adriana was built for now-defunct Hellenic Mediterranean Lines as the Aquarius, way back in 1972. It is now owned by St. Kitts and Nevis-registered Adriana Cruises, offering year-round sailings from Port of Spain, Trinidad, to the Grenadines. No. 23: MV Adriana. Adriana’s interiors have been revamped in recent years and now exude a nautical feel accented with rustic wood tones. This ship offers an informal, old-fashioned, budget cruise experience without all the bells, whistles and dining options of typical modern cruise ships. No. 22: Oceania Class. Oceania Cruises' 1,262-guest, 66,000-gt Oceania Class twins, the 2011-built Marina and the 2012-built Riviera (shown), are among today’s more fetching cruise ships. Although their sterns are a bit overbuilt and they lack promenades, they look their best from a 3/4 bow vantage with their long bows and pleasingly proportioned, curvaceous superstructures. No. 22: Oceania Class. The Marina (shown) and Riviera are modest-sized and thoughtfully designed, offering multiple dining venues, numerous and varied public spaces that include a spacious observation lounge, beautifully appointed staterooms and impressive art collections curated by Oceania Cruises’ CEO Frank Del Rio. No. 22: Oceania Class. The Oceania Class ships have an especially nice teak-lined and fountain-enhanced midships pool area at the base of a tall, conical funnel. These ships score extra points for their fine exterior detailing. No. 22: Oceania Class. The upmarket Marina and Riviera have been fitted with high-quality interiors that are more elegant than edgy or trendsetting. Their reception lobbies boast a grand, double helix staircase with iron and glass railings, marble surfacing and a Lalique crystal table. No. 22: Oceania Class. Pleasingly circular and elliptical forms are employed throughout the Marina and Riviera. They are especially evident in the crystal lighting of their multi-tiered main dining rooms. No. 21: Club Med Class. Two sail-enhanced, diesel-powered ships that were originally conceived for Windstar Cruises and completed for Club Med Cruises now operate as Windstar Cruises' Wind Surf (shown) and Club Med Cruises Club Med 2. No. 21: Club Med Class. Club Med 2 (shown) and Wind Surf boast four computer-operated masts that tower above their long, pointed bowsprits and winged, forward-situated funnels. In addition to having two swimming pools, water sports marinas unfold from their nicely rounded sterns. No. 21: Club Med Class. At 14,745 gt and with a capacity for 310 guests, the recently revamped Windsurf, which was built in 1989 as the Club Med 1, boasts tiers of beautiful teak decks that are ideal for sunning and al fresco dining. No. 21: Club Med Class. The 1992-built Club Med 2 is marketed in France and offers an active, French-themed cruise experience. No. 21: Club Med Class. Club Med 2’s recently refitted, bright and airy interiors are infused with natural light. No. 20: The original “R” ships. Eight identical, 30,277-gt, 684-guest ships were completed for now-defunct Renaissance Cruises between 1998 and 2001. Two of these nicely proportioned ships look especially nice in their deep blue-hulled livery for Royal Caribbean-owned Azamara Club Cruises: the Azamara Journey (ex R Six) and Azamara Quest (ex R Seven, shown). No. 20: The original “R” ships. Upscale Oceania Cruises operates four of the former R ships (Insignia, ex R One, shown; Regatta, ex R Two; Nautica, ex R Five and Sirena, ex R Four). No. 20: The original “R” ships. Carnival Corp. owns two of the R ships, including the successor to the original “Love Boat," Princess Cruises’ Pacific Princess (ex R Three, shown) and Fathom Cruises Adonia (ex-R Eight), the latter to be transferred back into the fold of British-based P&O Cruises when Fathom ceases operations later this year. No. 20: The original “R” ships. These ships provide an intimate alternative to mega-ship cruising but still offer a number of big-ship perks like a well-equipped spa, a large lido and pool area, as well as multiple dining venues. No. 20: The original “R” ships. All eight R ships were originally fitted out with identical Edwardian and Georgian-themed decor, but recent makeovers have given each their own distinctive interior look. This is the newly redone Horizons observation lounge aboard Oceania’s Sirena. No. 20: The original “R” ships. All of the ex-R ships boast a grand staircase and lobby that evokes the great early 20th-century liners like the Mauretania, Aquitania and Titanic. No. 19: MV Lofoten. The hard-working MV Lofoten is one of the longest continually serving major passenger ships, having operated on the regularly scheduled Hurtigruten or Norwegian coastal run since it was built in 1964. No. 19: MV Lofoten. Shown in its original livery, the splendidly proportioned Lofoten measures 2,621-gt and can carry up to 149 berthed passengers with additional space for 251 on deck. This modest but handsome liner can also carry up to 708 cubic meters of cargo. No. 19: MV Lofoten. Lofoten’s interiors boast magnificent old-world craftsmanship and wood paneling. In 2001, it was declared a protected ship by the Norwegian Director General of Historic Monuments. No. 19: MV Lofoten. Lofoten’s observation lounge has much of its original paneling and furnishing. Since it sails only in Norwegian waters, the ship is exempt from international Safety of Life at Sea fire regulations that prohibit wood construction on overnight passenger ships. No. 19: MV Lofoten. The Lofoten’s Dining Room is another beautifully preserved time capsule space with original wooden paneling and artwork. No 18: Silver Shadow Class. Silversea is a deluxe cruise line with a fleet of nine all-inclusive luxury and expedition ships that includes the sleek, 2000-built Silver Shadow (shown) and 2001-built Silver Whisper. No 18: Silver Shadow Class. The Silver Shadow and Silver Whisper measure 28,258-gt and carry a mere 382 guests, giving them a passenger space ratio of 73 that ranks them among the most spacious cruise ships in the world. They are also the line’s most handsome ships, sporting nicely flared bows and low, streamlined superstructures. No 18: Silver Shadow Class. The Silver Shadow and Whisper are elegantly appointed with comfortable, homey, understated public spaces. No 18: Silver Shadow Class. The spacious dining rooms on the Shadow and Whisper evoke an Old World ambiance with their recessed lighting, crystal chandeliers, muted color schemes and parquet woodwork. No 18: Silver Shadow Class. The Silver Shadow and Whisper are all-suite ships with some of the largest staterooms on the seven seas. No. 17: Windstar’s Power Yachts. Now owned by Seattle-based Windstar Cruises, this yacht-like trio of ships has a uniquely futuristic and pleasing profile. The 1989-built Star Breeze (ex Seabourn Spirit, shown), 1988-built Star Pride (ex Seabourn Pride) and 1992-built Star Legend (ex Seabourn Legend) measure 9,975 gt and carry 208 guests. No. 17: Windstar’s Power Yachts. Oslo-based architects Yran and Storbratten have given these sleek vessels a graceful, nuanced look topped with unique funnel casings that did not translate as well on the ships’ much larger, 32,000-gt replacements, the Seabourn Odyssey class. Shown here, just months before its sale to Windstar is the Seabourn Spirit, now Star Breeze. No. 17: Windstar’s Power Yachts. The Power Yachts have teak-lined midships lido areas that are sheltered from the wind. They are ideal for sunning, deck parties and Windstar’s legendary al fresco buffets. No. 17: Windstar’s Power Yachts. Upon delivery to Windstar, the three Power Yachts were completely refurbished with a contemporary new interior look. This is the AmphorA Restaurant onboard the Star Breeze. No. 16: Celebrity Solstice Class. If this list were based solely on interior design and layout, Celebrity Cruises’ five-member Solstice Class ships would rank much closer to the pole position. However, their powerful and dynamic, wedge-like profiles are considerably more Darth Vader than Grace Kelley. No. 16: Celebrity Solstice Class. This “most impressive” 122,000--gt, 2,850-guest quintet includes the 2008-built Celebrity Solstice, the 2009-built Celebrity Equinox, the 2010-built Celebrity Eclipse, the 2011-built Celebrity Silhouette (shown) and slightly larger 2012-built Celebrity Reflection. No. 16: Celebrity Solstice Class. Even their mega-ship proportions cannot overwhelm a magnificent midships pool area that blends classic forms with fountains and a Space Age finish. They also boast a park-like Lawn Club with real grass, situated between their finely sculpted smokestacks and a solar panel-topped, glass-enclosed indoor pool area. No. 16: Celebrity Solstice Class. The Solstice Class ships boast some of the most spectacular observation lounges ever put to sea. Their interiors are the product of no less than seven design teams that have been curated and supervised by parent company Royal Caribbean’s Executive VP of Maritime and Newbuild, Harri Kulovaara. No. 16: Celebrity Solstice Class. Hospitality architect Adam Tihany made his sea-going debut with the Solstice Class main dining rooms. In the Celebrity Solstice’s Grand Epernay, the ceiling appears to rest atop a network of supports that resemble a rib cage. Meanwhile, a double-deck wine cellar emulating a ship’s prow opposes the grand staircase in its center. No. 15: MV Crystal Symphony. Crystal Cruises’ 1995-built, 51,044-gt, 922-guest Crystal Symphony is a slightly amended version of the 1990-built Crystal Harmony cruise ship that launched Crystal Cruises. It remains one of the prettiest of today’s vessels with a sharply raked bow, sleek lines and relatively low, well-proportioned superstructure. No. 15: MV Crystal Symphony. The ulra-luxe Symphony has simple but refined detailing that holds up at every angle, thanks to the guiding hand of the legendary, late marine architect Robert Tillberg. No. 15: MV Crystal Symphony. The Crystal Symphony will be getting a top-to-bottom interior make-over later this year but its original decor is nonetheless understated and restrained, resisting the “more is better” trend favored by some of Crystal’s luxury cruise line competitors. At the heart of the ship is a skylight-topped atrium with a water fountain. No. 14: MV Asuka II. This unique, 50,142-gt, 960-guest ship caters exclusively to the deluxe Japanese cruise market. If its profile looks familiar, that is because it was once a staple in U.S.-based cruising and ranked at the top of the luxury cruise tier. No. 14: MV Asuka II. The Asuka II is, of course, the former Crystal Harmony, the ship that launched Crystal Cruises in 1990. Although very similar to the Crystal Symphony, the Harmony’s funnel was situated slightly farther forward and the angle of its superstructure was more pronounced, making it the slightly more pretty of the pair. No. 14: MV Asuka II. As built, the Harmony’s Robert Tillberg-designed interiors were the latest in Scandinavian elegance and refinement, albeit with a slightly Art Deco flourish. No. 14: MV Asuka II. Since 2005, the ex-Crystal Harmony has been sailing for Crystal’s former parent company, NYK Line (Nippon Yusen Kaisha), which is one of today’s biggest container shipping conglomerates. Prior to World War II, NYK was one of the world’s largest passenger shipping lines but now it operates just one cruise ship. No. 13: Wind Star Class. Windstar Cruises 1986-built Wind Star (shown) and 1988-built Wind Spirit were part of a trio that included the 1988-built Wind Song, which was deliberately sunk after an engine room fire in 2003. These 5,307-gt, 159-guest ships were the first all-new sail-enhanced major cruise ships to be built in decades. No. 13: Wind Star Class. With their racy, low profiles, tall, slender funnels and pronounced bowsprits, these ships even look beautiful with their stern marinas extended and without their sails unfurled. They have shallow drafts that enable them to visit off-the-beaten-track hamlets like Monemvasia in Greece. No. 13: Wind Star Class. Under their canopy of sails, the Wind Star and Wind Spirit have gorgeous teak decks, a wading pool bordered by a Jacuzzi and skylights that infuse their interiors with natural light. No. 13: Wind Star Class. After Windstar was purchased by new owners, Xanterra Resorts, the ships were given extensive refits with an elegant, contemporary new look that replaced the nautically themed stylings of renowned original designer Marc Held. This is the Wind Star’s AmphorA Restaurant. No. 12: Royal Clipper. Styled after the five-masted sailing ship Preussen of 1902, Star Clipper’s 5,000-gt, 227-guest Royal Clipper is a hybrid diesel/sailing ship that currently ranks in the Guiness World Records as the world’s largest passenger sailing ship. No. 12: Royal Clipper. With its 56,000 square feet of sails unfurled, the Royal Clipper is an awe-inspiring sight. Unlike the Windstar and Club Med vessels that combine modern aesthetics with sails, the Royal Clipper is very much a throwback to the pre-steam era of windjammers. Despite that, underneath the convincing exterior beats the heart of a very advanced vessel. No. 12: Royal Clipper. Royal Clipper’s impeccably scrubbed teak deck areas are filled with winches, ropes, bollards and capstans. They are also home to three wading pools and an al fresco bar. On the Royal Clipper, guests have the unique opportunities of climbing the mast or into the bowsprit net to dangle over the surging sea. No. 12: Royal Clipper. The Royal Clipper’s interior evokes an almost Jules Verne vibe with a three-deck atrium topped with a skylight that is actually the glass bottom of the ship’s largest pool. At the atrium’s base is the Restaurant, while the mid-level balcony features murals by artist Rainer Maria Latzke. No. 12: Royal Clipper. Other spaces on the Royal Clipper exude an Old World ambiance, such as the Library with its mahogany-toned paneling and cabinetry, brass-framed windows, brass lamps and tufted leather settees. No. 11: Disney Dream Class. At 129,690 gt.,Disney’s two largest vessels, the 2011-built Disney Dream and its twin, the 2012-built Disney Fantasy, are extraordinarily handsome vessels whose profiles are inspired by the streamlined, triple-funneled liner Normandie of 1934. No. 11: Disney Dream Class. Were they just a deck or two “shorter” and without the clutter of the AquaDuck water coasters on their upper decks, the mega ships would surely rank even higher for their powerful profiles. Note the long bow and faux sheer created by dipping the hull’s black paintwork down towards the center of the ship. No. 11: Disney Dream Class. The two giant, black-topped crimson funnels certainly have their share of “Normandie-ness” but one wonders why Disney’s architects didn’t just give the Dream and Fantasy three stacks to achieve the ultimate effect. No. 11: Disney Dream Class. What is evident in every aspect of the Disney Dream and Disney Fantasy’s design and construction is the attention to detail. Even something as incidental as the tubing on the AquaDuck lends itself to close scrutiny. Clearly, no expense was spared in building these ships. No. 11: Disney Dream Class. Keeping in mind that these vessels are as much floating family amusement parks as they are cruise ships, their interiors are nonetheless impressive, employing quality elements such as crystal, brass, marble and ultra-plush carpeting. No. 10: MV Prinsendam. Holland America Line’s smallest ship, the 38,848-gt, 740-guest Prinsendam, is nicknamed “The Elegant Explorer." Were it not for a less-than-flattering block of cabins added to its stern in recent years, it may have ranked even higher on this list. No. 10: MV Prinsendam. The Prinsendam was built in 1988 as the Royal Viking Sun for Royal Viking Line, which at the time was one of the world’s most deluxe cruise lines. In a few ways, the Royal Viking Sun was a smaller prototype of Viking Cruises' new Viking Ocean class of ships, with its long clipper bow and streamlined funnel casing. No. 10: MV Prinsendam. Although Prinsendam is the oldest ship in the HAL fleet and lacks the amenities and multiple dining options of the line’s newest vessels, it enjoys a fiercely loyal repeat guest following, thanks to its modest size and now-classic features like teak-lined decks, a panoramic observation lounge and a full wraparound promenade deck. No. 10: MV Prinsendam. In recent years, Holland America has refreshed the Prinsendam’s understated public spaces with new furnishing and soft fittings. No. 9: Royal Viking Trio. That one, let alone all three, of these ultra-sleek, first-generation cruise ships is still in active service is a testament to their once-innovative and still strikingly beautiful design. U.K.-based Fred. Olsen Cruises operates two of the original Royal Viking Line ships, the 1972-built Black Watch (ex-Royal Viking Star, shown) and the 1973-built Boudicca (ex-Royal Viking Sea). No. 9: Royal Viking Trio. As built, the three nearly identical sister ships measured 22,000 gt and carried 539 passengers. Their ultra-raked clipper bows, streamlined superstructures, QE2-inspired funnel casings and terraced afterdecks were signature features of their time. With their light, airy Scandinavian interiors and modern artwork, they were the ultimate luxury cruise ships of the day. No. 9: Royal Viking Trio. Between 1981 and 1983, the three sisters were expanded with 91-foot midsections that increased their tonnage to 28,221 gt and passenger capacity to 820. After leaving the Royal Viking fold, all three ships have gone on to a variety of incarnations. No. 9: Royal Viking Trio. After numerous refits, Fred. Olsen Cruises’ Black Watch looks as good as ever and maintains a very loyal following. The ship has just emerged from a multi-million pound refit that should keep it going for many more years. This is the Black Watch’s revamped Glentanar Restaurant. No. 9: Royal Viking Trio. Fred. Olsen’s Boudicca is also enjoying a very healthy career in British-based cruising. The former Royal Viking Sea, shown here passing Scotland’s Dunnet Head, looks stunning in Fred Olsen’s dark gray hull livery. No. 9: Royal Viking Trio. The third of the original Royal Viking trio sails on as Phoenix Seereisen’s Albatros for the German market. Like its Fred. Olsen-owned sisters, the well-maintained Albatros enjoys a devoted following. No. 8: MV Marco Polo. U.K.-based Cruise and Maritime Voyages’ classic 22,080-gt, 820-passenger Marco Polo has come a long way from its origins as a Soviet-era trans-oceanic liner. For a short while when it was cruising out of U.S. ports in the mid-1970s, it was rumored to be a "spy ship." No. 8: MV Marco Polo. The second of five nearly identical sister liners named for Russian poets, Marco Polo was built in 1965 as the Alexandr Pushkin for Soviet-owned and operated Baltic Shipping Company. The handsome vessel was sold to newly formed Orient Lines in 1991 and completely rebuilt for their expedition cruise service. No. 8: MV Marco Polo. Sturdy East German construction and an ice-strengthened bow have served the Marco Polo well on its globe-trotting journeys. In 2010, it began operating for Cruise and Maritime Voyages and continues to do so with a loyal following. No. 8: MV Marco Polo. The Marco Polo is one of the last large active passenger ships in the world with tangible elements of sheer (lengthwise curvature) and camber (side-to-side curvature). What it lacks in newfangled amenities, it more than makes up for in visual appeal and Old World character. No. 8: MV Marco Polo. The ship’s aft decks were rebuilt with a wonderful series of terraces that form an outdoor amphitheater overlooking the stern. No. 8: MV Marco Polo. Marco Polo’s interiors all date from the early 1990s and feature an Art Deco-inspired look courtesy of Greek interior designer Michalis Katzourakis. This is the ship’s Seven Continents Restaurant. No. 8: MV Marco Polo. Marco Polo’s original Sulzer diesel engines were so solidly constructed and well-maintained that even after over 50 years of hard use, they still function beautifully. They are the key to the ship’s longevity and success. No. 7: Star Flyer Class. Star Clipper’s sailing yachts Star Flyer (shown) and Star Clipper, built in 1991 and 1992 respectively, are a striking pair of 2,298-gt, 170-guest, four-masted barquentines, the first designed to carry passengers since 1912. No. 7: Star Flyer Class. Like their larger fleetmate Royal Clipper, the Star Flyer and Star Clipper have teak decks that brim with sailing gear and ropes. They also sport a pair of wading pools, an outdoor bar and a generous amount of sunning space. No. 7: Star Flyer Class. Although their sails are augmented with Caterpillar diesels in order to maintain a set schedule, in every other aspect, these are true tall ships. No. 7: Star Flyer Class. As with the Royal Clipper, Star Flyer and Star Clipper guests have access to a long bowsprit where they can dangle over a swelling sea. Guests can also climb to the mast platform. No. 7: Star Flyer Class. The Star Flyer and Star Clipper were fitted out with a convincingly vintage interior look that boasts dark wood tones, heavy wooden-framed furnishings and brass fixtures. Their libraries even boast a marble and brass fireplace mantel. No. 6: MV Nordstjernen. The 2,191-gt, 149-guest Nordstjernen is the real thing, an active vintage liner and not a modern-day reproduction. This splendidly handsome and well-preserved vessel operates on summer charter service for its former owners, Hurtigruten, on cruises from Norway’s northernmost Svalbard archipelago. No. 6: MV Nordstjernen. The Nordstjernen, shown in a vintage postcard view, was built in 1956 for now-defunct Bergen Steamship Company’s regularly scheduled Norwegian coastal or Hurtigruten service. In 2012, it was sold to present owners Vestland Rederi, and sent to Poland for a complete restoration. No. 6: MV Nordstjernen. Now back in its original livery, the Nordstjernen is a true stunner. In 2012, it joined its 1964-built fleetmate Lofoten with “protected” status designation from the Norwegian Directorate for Cultural Heritage. No. 6: MV Nordstjernen. The Nordstjernen’s paintwork and teak decks are absolutely immaculate. No. 6: MV Nordstjernen. The ship’s public spaces have all been refreshed with new soft fittings but retain their original vintage feel. The forward lounge boasts carved wooden panels by the late Paul Rene Gauguin, grandson of the famed painter. No. 6: MV Nordstjernen. Nordstjernen’s forward staircase boasts a large panel of a “merhorse” by Paul Rene Gauguin. Note the surrounding paneling and vintage fixtures. No. 5: Sovereign Class. Royal Caribbean’s groundbreaking Sovereign Class were the first built-from-scratch mega cruise ships. The initial ship in the series, which now sails as Spanish-based Pullmantur Cruises’ blue-hulled Sovereign, was introduced in 1988 as the Sovereign of the Seas. No. 5: Sovereign Class. The largest cruise ship in the world when built, the Sovereign of the Seas measured 73,192 gt and could carry 2,800 passengers. Designed by the late Njal Eide, the ship featured gracious curves and a stern inspired by that of the still-influential, 1934-built French liner Normandie. No. 5: Sovereign Class. The Sovereign of the Seas was followed in 1990 by the slightly larger, 73,937-gt Monarch of the Seas. Compared to what would follow, these ships were especially good-looking with their long bows, terraced superstructures and clean lines. No. 5: Sovereign Class. The Monarch of the Seas was transferred to Royal Caribbean’s Pullmantur Cruises division in 2013 and currently sails for the Spanish-speaking market as the blue-hulled Monarch. No. 5: Sovereign Class. The Sovereign Class ships boasted a huge midships lido area for their time, with two large pools. They also had Royal Caribbean’s trademark Viking Crown Lounge, a 360-degree space enclosed in full-length glass panels cantilevered from their funnels. No. 5: Sovereign Class. Architecturally, the Sovereign Class set a new bar in modern cruise ship design, employing dynamic, streamlined shapes and utilizing numerous skylights to help infuse their interior spaces with natural light. No. 5: Sovereign Class.The third ship in the Sovereign Class, the 73,941-gt Majesty of the Seas, was introduced in 1992. A proposed transfer to Pullmantur in 2016 was called off and the ship continues to sail for Royal Caribbean. Once the largest cruise ship in the world, it is now one of the oldest and smallest in the Royal Caribbean fleet, barely a third the size of the line’s 225,282-gt Oasis Class ships. No. 4: Viking Ocean Class. Expectations were high when longtime river stalwart Viking Cruises announced its first ocean-going cruise ships way back in 2013. The line had already set a new bar with its innovative Longship Class river vessels but the 47,800-gt, 930-guest Ocean Class ships, ushered in by the 2015-built Viking Star (shown) may be even better. No. 4: Viking Ocean Class. The identical Viking Star and 2016-built Viking Sea (shown) will be followed this year with the Viking Sky and Viking Sun and in 2018 and 2019 with the Viking Spirit and an unnamed sister. Their gorgeous exteriors feature long clipper bows inspired by the legendary Stella Polaris cruise ship of 1927, gently terraced superstructures and racily streamlined funnels (see Prinsendam). Their modest dimensions contain nuances of curvature and a symphony of well-integrated angles to please the most discerning eye. No. 4: Viking Ocean Class. The Viking Ocean ships offer an upmarket cruise experience with included excursions and Internet, drinks at lunch and dinner and numerous other perks that are covered in the fare. The midships pool, which can be enclosed with a sliding glass dome, looks like that of an upscale resort with its terraced levels and designer deck chairs. No. 4: Viking Ocean Class. Viking Ocean ships get an extra nod for having unfettered forward-facing observation decks, a fully encircling promenade deck and an infinity pool that overlooks the ship’s wake. No. 4: Viking Ocean Class. In an era where many cruise lines are relegating all forward-facing space to revenue-generating cabins and spas, Viking bucks the trend with a spectacular double-deck observation lounge that provides some of the best views at sea. And the decor is stunning, with top-notch furnishings and a pair of moss gardens. No. 3: Disney Magic Class. One doesn’t even have to be a Disney fan to appreciate the beautiful ships Disney Cruise Line “imagined” with its 83,338-gt, 2,700-guest, 1998-built Disney Magic (shown) and 1999-built Disney Wonder. They convincingly evoke the great trans-Atlantic liners with their long bows, twin funnels (note how the aft funnel is slight taller) and dynamically coordinated angles and curves. No. 3: Disney Magic Class. Externally, the Disney Magic and Wonder are especially appealing for their relatively low, sleek profiles, which make the Disney Dream Class seem a bit overbuilt by comparison. While the pair is identical in form and layout, the Magic’s interiors have an Art Deco theme, versus the Wonder’s Art Nouveau trappings. No. 3: Disney Magic Class. Following a recent refit, both ships’ sterns were somewhat spoiled with the addition of a ducktail, or sponson, that helps maximize their hydrodynamic efficiency. No. 3: Disney Magic Class. For comparison, here is a view of the Wonder before its stern was modified. No. 3: Disney Magic Class. Like the great liners of the past, the Disney ships have wonderful, fully encircling, teak-lined promenade decks. No. 3: Disney Magic Class. Guests enter via a soaring lobby with ornate bronze railings (note the Mickey Mouse insets), polished marble and plush carpets. On the Wonder (shown), there is a sculpture of Ariel, the title character from "The Little Mermaid." Both ships are segregated into adults-, family- and kids-only zones. No. 2: MV Queen Mary 2. If that iconic orange and black funnel were just a few feet taller, Cunard Line’s mighty Queen Mary 2 might well have topped this list. Alas, since the entire ship needs to clear New York’s Verrazano Narrows Bridge, it’s probably best that it remains just as it is. No. 2: MV Queen Mary 2. This magnificent QM2 doesn’t just emulate the look of a great liner, it actually is one, beginning with a powerful-looking, long bow, that has been reinforced to forge the most challenging of seas. Its deep draft, taller hull-to-superstructure ratio and high maximum speed (30 knots) lend themselves to crossings as well as globe-trotting cruise service. No. 2: MV Queen Mary 2. Fresh from a multi-million dollar refit that saw the addition of new cabins and the complete refurbishment of all deck areas and public spaces, the 2,961-guest, 151,800-gt Queen Mary 2 is more splendid than ever. The only regularly scheduled trans-Atlantic liner in service between New York and Southampton, it continues a tradition that began with Cunard’s RMS Britannia of 1840. No. 2: MV Queen Mary 2. Built in 2003, decades after the jumbo jet decimated the ocean liner, the Queen Mary 2 takes much of its inspiration from past Cunard ships like its namesake, the first Queen Mary of 1936, the first Queen Elizabeth of 1940 and the ship that replaced them both, the recently retired Queen Elizabeth 2 of 1968. No. 2: MV Queen Mary 2. The Queen Mary 2 has acres of open teak deck and a beautifully terraced stern with two large pools that overlook the ship’s wake. It also has a fully encircling promenade deck with cushioned teak deck chairs, multiple forward observation terraces and a pool that can be covered by a sliding glass dome in inclement weather. No. 2: MV Queen Mary 2. Another space that was completely revamped with a very chic retro vibe, the legendary Queens Grill Restaurant is where the ship’s most lavish Duplex, Penthouse and Queens Suite guests dine. No. 1: Sea Cloud. Encountering the ultra-deluxe Sea Cloud is an almost otherworldly experience. It is the real deal, a survivor of a bygone era, combining splendid architecture with museum-quality craftsmanship and a luxury cruise experience on par with that of a private yacht -- which is fitting, since it was actually built as one. No. 1: Sea Cloud. Sea Cloud was built as the Hussar V (shown) in 1931 for socialite and heiress Marjorie Merriweather Post. Renamed Sea Cloud in 1935, it would go on to serve as a U.S. Navy weather ship in World War II, a private yacht for Dominican Republic ruler Rafael Trujillo and a school ship before being converted to a cruise ship in 1978. No. 1: Sea Cloud. The 3,077-gt vessel now carries up to 64 guests who are tended to by a crew of 60. Its sails are augmented by a diesel engine that drives twin screws at a leisurely speed of 14 knots. No. 1: Sea Cloud. The Sea Cloud’s wheelhouse has a combination of beautifully maintained original equipment and the latest in navigation technology. No. 1: Sea Cloud. The ship’s spectacular wood-paneled interiors had to be carefully modified and fireproofed in order pass the latest, most stringent Safety of Life at Sea (SOLAS) requirements. This is a corner of the oak-paneled lounge. No. 1: Sea Cloud. There may be bigger sea-going accommodations but few can rival the Sea Cloud’s two top suites, which feature carved oak paneling, marble fireplaces and brass fittings.